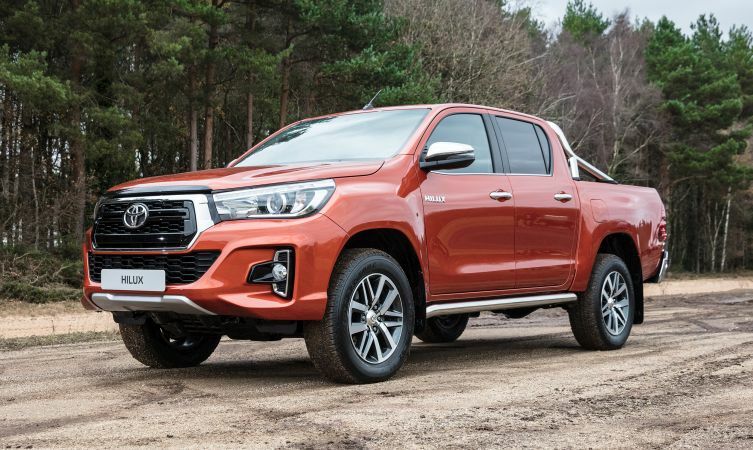 The Toyota Hilux marks its 50th anniversary with two new versions taking the spotlight at the Commercial Vehicle Show at the NEC in Birmingham. The all-conquering pick-up gains a new top-of-the-range Invincible X model, plus a new Limited Edition* version (pictured throughout this post) with just 150 examples available for UK customers. The Invincible X stands apart from the rest of the Hilux line-up with a new frontal treatment. This includes a new grille with gloss black inserts and contrasting chrome frame, plus a new-look front bumper, fog lights and silver under-run. The striking styling continues at the rear where there is a new step and a silver under-run beneath the licence plate. Inside, the Double Cab cabin has an all-black theme, with contrasting chrome instrument panel trim and piano black inserts on the dashboard, door panels, steering wheel and gear shift lever and surround. The instrument binnacle also has new features, including smart white dials and a centre TFT multi-information display with a dedicated Invincible X start-up animation that activates each time the ignition is switched on. Even the key is model-specific, featuring a silhouette sketch of the new frontal design. In terms of equipment features, the Invincible X matches the existing Hilux Invincible specification. 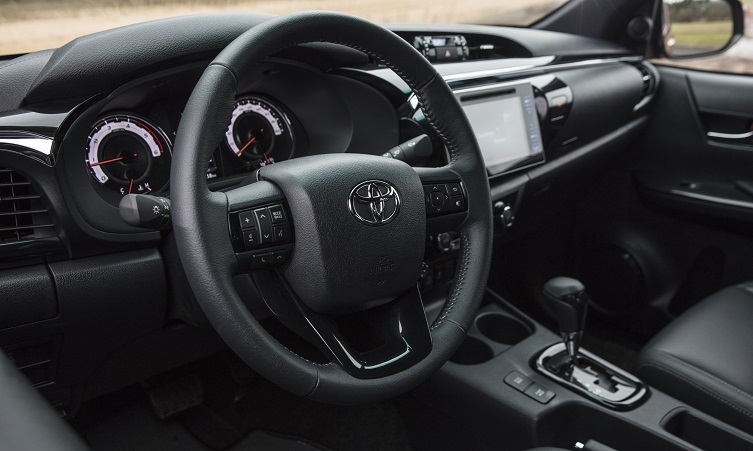 Features include Toyota Safety Sense, with Pre-Collision System Lane Departure Warning and Road Sign Assist, plus cruise control, Toyota Touch 2 with Go multimedia system with navigation and six-speaker audio system, Bluetooth, rear-view camera, automatic air conditioning and leather upholstery. 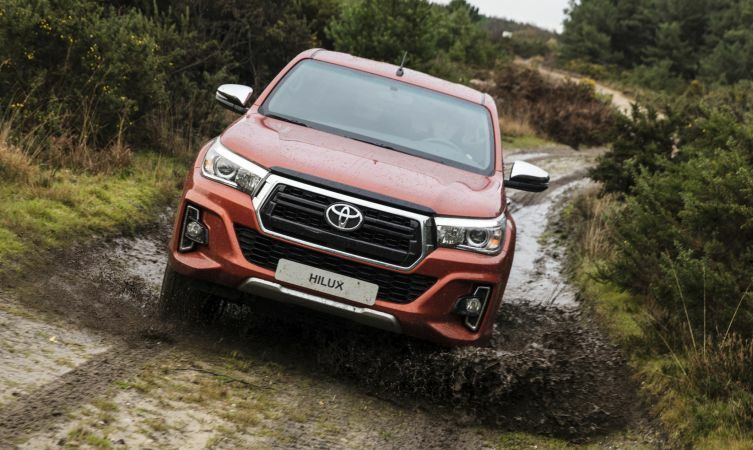 Powered by a 148bhp 2.4-litre D-4D engine and equipped with a six-speed automatic transmission, the new Hilux Invincible X has all the quality, durability and reliability that has made Toyota’s pick-up a world-leader in robust, go-anywhere performance. 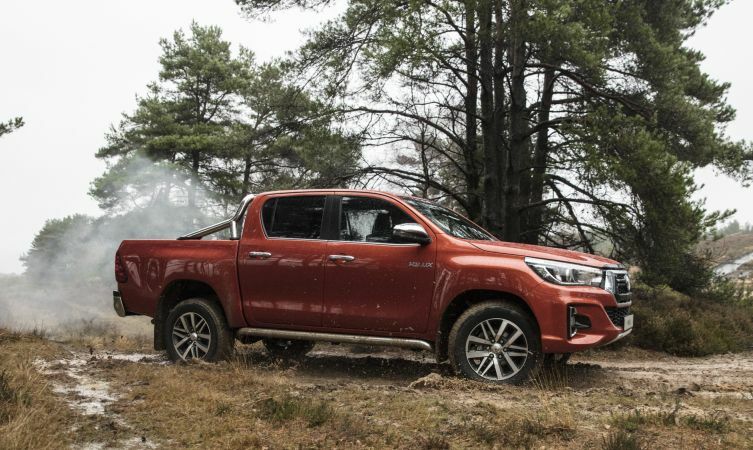 For customers seeking extra exclusivity, the new Hilux Invincible X is also being offered in a new Limited Edition* version of just 150 vehicles – as illustrated in these images. Creating an even more dramatic street presence, this will be available exclusively in two stand-out body colours: Scorched Orange (pictured) and Nebula Blue. These provide a strong contrast with the model’s black exterior styling elements, including black 18-inch alloys, side steps and high-over bar. In other respects, the Limited Edition matches the Invincible X, including the new all-black cabin treatment. Both new Hilux versions will be available from July with prices to be announced nearer the on-sale date. More information about the heritage of the Toyota Hilux and its achievements can be found at this special 50th anniversary website. What else is Toyota displaying at the Commercial Vehicle Show? The Toyota stand at the Commercial Vehicle Show features a number of important new additions to our light commercial range, including new conversions. This includes the Arctic Trucks Hilux AT35, newly available for UK customers; the new Land Cruiser Utility Commercial model; the Lunar Toyota Proace Lerina campervan conversion by Wellhouse Leisure; and a Britvic-liveried Proace, which marks a significant fleet order for the medium-duty van from the leading soft drinks manufacturer. 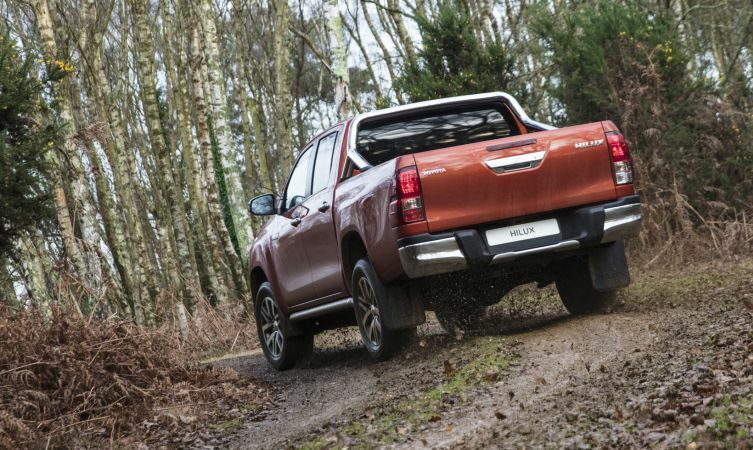 We’d love to give you further information about our Hilux zombie testing programme. However, under the Prevention of Nonsensical Hysteria Act 1968, we are unable to confirm or deny the presence of zombie virus on British soil. Silly PCP offers that look like a desperate attempt to gain sales and daft childish advertising or a waiting list for the 2.8 it’s your choice!! Thank goodness you wrote this. I thought I’d imagined it! I cannot find reference to the advert anywhere. It’s just a radio ad right? Is there a TV version? The advert is only on the radio. Or just the higher grades? Will we have to wait for brexit and hope they lower import duty before we see the bigger engines or will someone in your product team realise many potential buyers will pay a premium price for the 2.8 , shame to lose loyal customers to ford and VW for lack of choice .. The facelift is currently only available on the Invincible X and Limited Edition models. With regards to your question about the 2.8 engine we have no information about this powertrain being available for the Hilux in Europe. The 2.4 engine has more torque than the outgoing model and an increased towing capacity. reference the question about the 2.8 engine. I know the 2.4 enginer has more torque but it is sluggish as higher speeds. The torque 400NM is only between 1600 and 200 rpm. We are committed to our 2050 Environmental Challenge and to do this we are making our conventionally powered models more fuel-efficient and in some cases this means reducing the engine size. To find out more information on our 2050 Environmental Challenge follow this link: https://www.toyota.co.uk/world-of-toyota/environment/environmental-challenge-2050. Ok that makes sense. So on this basis we will not see this engine size available in the UK in the future. It would be interesting to know if existng customers have expirenced a lost of power at higher speeds. Currently, Morecambe Bay Search and Rescue (BSAR) have placed their trust in Hilux, using it to aid in rescue and recovery from quicksand, floods, snow and inaccessible areas during extreme weather. For more on this here: http://fal.cn/qgVh. The main reason is tax !! If you want the best , buy the Toyota!! thanks for this clear explaination.I was delaying my purchase of the new hilux as I thought the 2.8 engine would eventually become available. I never considered an alternative manufacturer . I want the best reliable pick up that will not let me down. Finners, thank you for what is the most likely and plausible reason behind the lack of 2,8 engine offered in Europe. I’m sad to say that performance is a big aspect for me, a lack of a suitable successor to my current Invincible 200 will invariably see me look elsewhere (Mercedes V6) to fill the gap. Very sad because I really didn’t want to look away from Toyota but I can’t see it as the best truck in class with such a power/performance deficit. Such a duty bracket clearly plays into the hands of the European manufacturers which smacks of protectionism!! Sad for Toyota and Hilux. The Hilux is not on the Motability Scheme.